At 11 a.m. today, a hurricane warning was issued for the Northern Leeward Islands, including St. Kitts and Nevis. Throughout the course of today, St. Kitts and Nevis will continue its preparation for the passage of Hurricane Irma. The hurricane is expected to begin affecting us as early as Tuesday evening, and citizens and residents alike must take every reasonable precaution to protect life and property, while reducing – wherever possible – the impact that the hurricane and its aftermath may bring. I must commend the National Disaster Mitigation Council of the National Emergency Management Agency (NEMA), chaired by the deputy prime minister, the Hon. Shawn Richards, for the proactive role it has undertaken to date to prepare our country for the passage of the hurricane. The council members are to be commended, in particular for the regularity of meetings, the frequency of critical information shared with the public, and the mobilization of resources of state agencies, civil society and NGOs. As prime minister and minister with responsibility for national security, I encourage all of our citizens and residents to do all in their power to minimize the impact of Hurricane Irma. At the individual, group, community and national levels, steps must be taken to protect and preserve life and, in so doing, help to expedite our recovery after the hurricane’s passage. I further encourage all to act NOW. The National Disaster Mitigation Council has been advising citizens and residents on measures to ensure their safety. I must also commend the religious community for the strong, demonstrative partnership role that it continues to play at this time. My cabinet is also heartened by the nation’s “Call to Prayer” issued by the clergy, in collaboration with the Ministry of Ecclesiastical Affairs. The intercessory hour of prayer, which was hosted by Dominion Radio 91.5 FM from 1-2 p.m. today, was intended to lift up our country to God in prayer as we invoke His divine protection. I thank the Rev. Dr. Calvin Hazel of Calvary Baptist Tabernacle for hosting this well-needed initiative. The general public is advised to stay tuned to local radio stations, [including] our state-owned radio station ZIZ for regular and reliable updates about Hurricane Irma. Citizens and residents are urged to remain alert and rely only on official sources of news about the hurricane. Such sources include NEMA, the Met Office and the website of the National Hurricane Center in Florida. I have reached out to representatives of the private sector and have reminded them to do what is necessary to safeguard their businesses in advance of the hurricane. I also encourage the business community to be lenient with their employees by affording them sufficient time off from work in advance of the hurricane so that they can adequately prepare their own families and households in good time. Let me urge all of us to take this seriously. The federal cabinet also urges all ministries and state agencies to be on highest alert and to follow the recommended protocols that are in place in preparation for the passage of hurricanes. The cabinet calls on ALL citizens and residents to do your part to prepare for the hurricane. I have been in touch with the honourable premier of Nevis, Vance Amory, who has informed me that all the preparations on the Island of Nevis are progressing smoothly. I have also been in contact with His Excellency the Gov.-Gen. Sir Tapley Seaton, who joins me in imploring that all residents treat this hurricane with the seriousness it warrants. [People] should also resist the urge to go outdoors during the hurricane and immediately afterward. 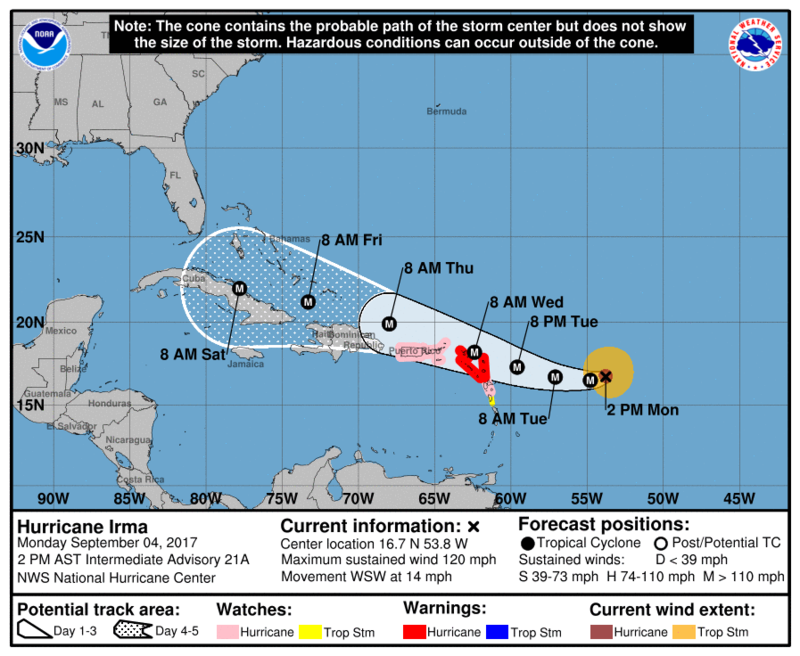 Regular safety updates on the hurricane will be provided by NEMA. Government has also engaged with heavy equipment operators within the public and private sectors to stand ready to assist with prompt recovery efforts should such needs arise. Before I close, it is my duty to inform the nation that the speaker of the National Assembly, the Hon. Michael Perkins, has informed me of the postponement of Thursday’s sitting of Parliament. This decision was taken in light of the imminent passage of Hurricane Irma. I must also inform the public that the Ministry of Education has decided that all government schools will remain closed until further notice. From tomorrow the CFBC and all Early Childhood Centres would also be closed until further notice. As we continue to prepare, let us all expect the best outcome, but prepare for the worst. Let us look out for our neighbours and remember that we are our brother’s keeper, in good times and in bad. Our goal is to preserve life and reduce the likelihood of risk and damage to property. I ask God’s protection on our nation and to him I give all glory, honour and praise!